A 55 year old man was referred to an oral surgeon for evaluation and treatment of an expansile multilocular radiolucency of the left mandible. The swelling had been noticed by the patient for approximately one year. 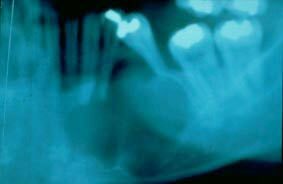 This radiograph demonstrates a well-demarcated multilocular radiolucency which, in areas, has a sclerotic border. Because the locules are fairly large, the first two lesions in the differential diagnosis should be favored. Slide 1 (medium power, H&E). 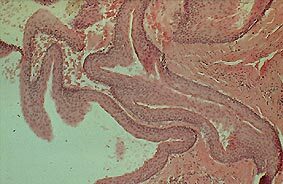 This is a portion of a cystic structure (lumen on the left, connective tissue on the right) lined by a thin layer of stratified squamous epithelium. Even at this power, the basal cell layer appears quite prominent. Slide 2 (high power, H&E). 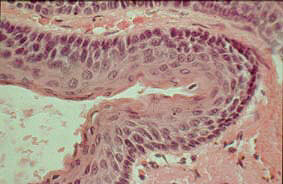 The surface epithelium is parakeratotic and corrugated (wavy). 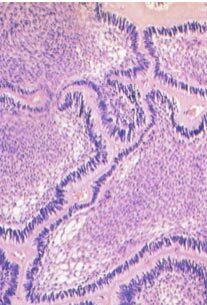 The basal cell layer contains tall basophilic nuclei.